interior "address sign" custom made with the longitude and latitude of your home address. 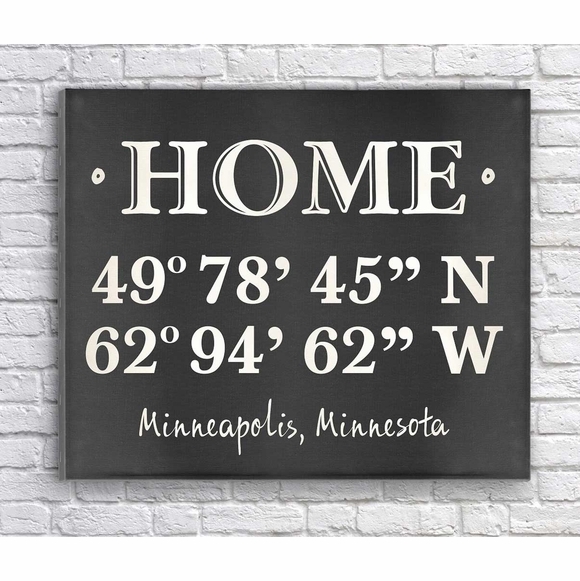 This stretched canvas print displays your home address coordinates, city, and state. Chic vintage wall art printed on a faux black chalkboard or tan parchment background. "HOME" at the top is standard. Please provide the address latitude and address longitude (without symbols) in this order: degrees minutes seconds direction, using the exact format (including spaces between each set of numbers) shown in the sample. Dimensions: 24"W x 18"H x 1/2". Home address longitude and latitude novelty wall art. It's an unexpected and awesome housewarming gift!